5 step hacking roadmap explained in an actionable workshop style webinar. We'll be doing live consulting with the audience. These are actionable things you can change to increase your traffic and rankings now. Make sure you have Google Webmaster installed and access to your website's backend. 1. Using SEMRush.com, gather all the rankings you’ve got to determine the baseline of your rankings. 2. Learn to use Google’s secret communication portal they reward you for using. 3. Steal the traffic from the major competition in your space. 4. Use the roadmap in Google Webmaster Tools. 5. 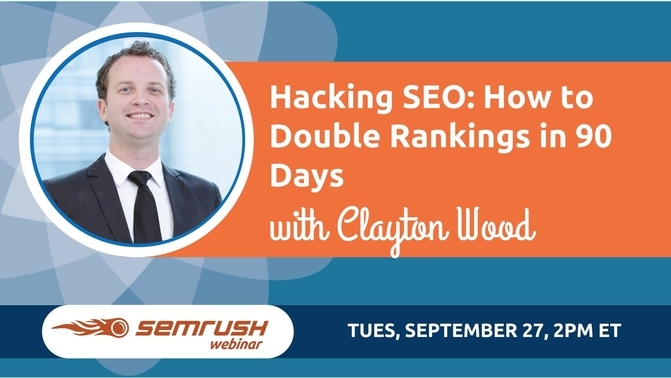 Scale the unscalable SEO tasks and learn the tools to do it with.